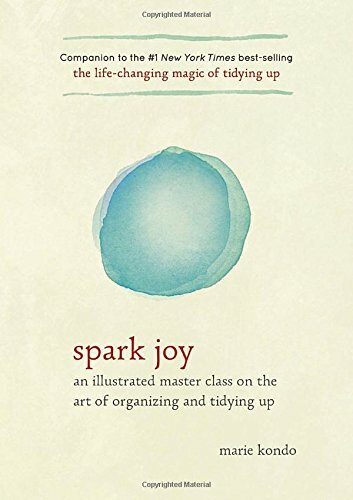 Unclutter your life to spark joy! Over the past year I have become buried under paper, books, and boxes; you can hardly see the desk or the floor in my office and it is becoming an uncomfortable place to be. I can never find anything and I am overwhelmed by the amount of stuff I have accumulated. So as part of my summer cleanse, I have decided it is time to tackle the clutter! I also challenge all of you if you have an area in your environment whether it be your closet, your office, your car, your garage, your computer (especially your email); take action today and start to unclutter your life. The Cambridge dictionary defines declutter as to ​remove things you do not need from a ​place, in ​order to make it more ​pleasant and more ​useful. Decluttering is a way of detoxifying your environment and get an increased sense of well-being. Excessive clutter is often a symptom and a cause of stress and can affect every aspect of your life. Clutter can distract you, weigh you down, generate a feeling of unease and inability to concentrate. If there is a lot of clutter in your life try not to get overwhelmed and procrastinate. So basically Kondo’s “KonMari” Method, means doing a purge of everything in one shot as completely as possible. Starting by category with clothes first, through to sentimental items, and you are left surrounded by things that you love and bring joy. Kondo says tidying up your home this way should be done once and completed rather than turned into a never-ending project. This sounds like a wonderful environment to live in, so this weekend I intent to start with my closet and work my way through the rest, …. gosh I feel rather excited! This entry was posted in Advice, Book Review, Health, Wellbeing and tagged declutter, joyful environment, unclutter. Bookmark the permalink. ← Vitalise Health is one year old today! !